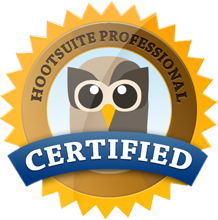 December 4, 2014 by Theresa B. Clarke 0 comments on "18 JMU Marketing Students Earn Designation as HootSuite Certified Professionals"
During the fall 2014 semester in my MKTG 384 course, students were offered an opportunity to earn a few extra credit points through a HootSuite Certification Assignment. One part of this assignment entailed students passing a certification exam to showcase knowledge about social media marketing. Topics included scheduling social media updates, tracking social media performance, managing team and information flow in social media, and working with social media reports. If you are interested in other types of social media certification, check out 8 places to get certified in social media.